In the good old, bad old days, you had to do all business via personal contact. There wasn’t any other way. When it was time to close the sale, you had to have built a relationship of trust that would lead people to buy. That can prove an even greater challenge now, because you may never meet the people you are selling to in person. Without the personal touch and verbal cues that face to face communication brings, you have to work harder to build trust and win the sale. Here are three key areas to target to do that. Before people consider buying from you, they’re going to check you out online. The first place they’ll start is your website, so that’s where trust building starts. A professional web presence makes you look like a legitimate business – no ad-ridden, cluttered home pages. These signals help to reinforce your professional image, build trust and get your potential customers to see you as a real person with a legitimate business. You can do even more. For example, you could create a video introduction to yourself and your business as a partial substitute for face-to-face communication. The research shows that people are programmed to pay attention to faces, voices and movement and to tune into emotion. That’s why video can help you connect with prospects you never meet. It’s a great introduction and it says that you’re willing to go the extra mile to make them comfortable. You can also use video to answer your prospects’ common questions, then reinforce that via your website with blog content and FAQs. Answer questions in advance and you remove another barrier to the sale. There’s one last aspect of your website to look after – social proof. Social proof shows prospects that other people have worked with you and found it a great experience. Amazon uses this all the time with star ratings and customer reviews. Some businesses with active social media followings showcase their Twitter stream or Facebook page to highlight the positive comments customers make. Only you will know what’s right for you, but consider getting some of your customers to talk about how great you are – it’s an excellent way to build trust. Check out this example from Lumos Networks to see how powerful it is. You know those links to social media profiles mentioned earlier? Your potential customers are going to check them out. What will they find when they look there? It’s important to create profiles on the main social media sites where your existing and potential customers are going to engage. This is not about making immediate sales; it’s about being present and building trust so they think of you when it’s time to buy. Respond as soon as you can to any concerns – people expect you to be responsive and quick. The point is, that’s where people check out your professional credentials, so you need a credible profile. Getting your LinkedIn profile right can help you find new sales prospects and help prospects find you. While some people hate LinkedIn’s Endorsements feature, you can’t deny that numbers talk. If more than 99 people have clicked a button to say you are an expert in your niche, that’s pretty impressive. Once sales prospects check out your website and social media profiles, they will be ready to talk. That’s where good communication practices can help build trust. Here are some elements to look after. Make sure you have an email address on your business domain. Business email sent from a Yahoo or Gmail branded address, instead of your own business brand, doesn’t look professional and doesn’t inspire trust. While we’re on the subject of email, be responsive. You don’t have to spend all day chained to your email – that’s counter-productive. Respond within a reasonable window (perhaps within 12-24 business hours) even if you’re simply acknowledging receipt. If it’s time for a phone call, think about your communication style. Some people find a stiff, formal manner off-putting, so try a professional, yet friendly approach. For best results, figure out your ideal communication style before a phone meeting. These tips on successful sales calls from Entrepreneur will also help. One key piece of technology which bridges the gap between online and face-to-face interaction is video messaging, available via Skype, Google Hangouts and more. Video meetings allow all participants to see the visual cues and nuances that are missing from written communication. Everyone gets a better feel for what’s happening, which helps cement the relationship. Some businesses use messaging platforms similar to WhatsApp to connect with customers and prospects. Since these now allow video messaging, they are another option for communicating with people. Even if it’s not always real time, you still get the benefits of video. Use branded templates for the emails you will need throughout the sales cycle. Create professional estimates using tools like PandaDoc (integrated with OnePageCRM). Make it easy to sign online contracts and agreements with a professional e-signature service. A branded, usable website, active and engaging social media profiles and smooth communication can help build a trusted relationship even if you don’t meet face-to-face. 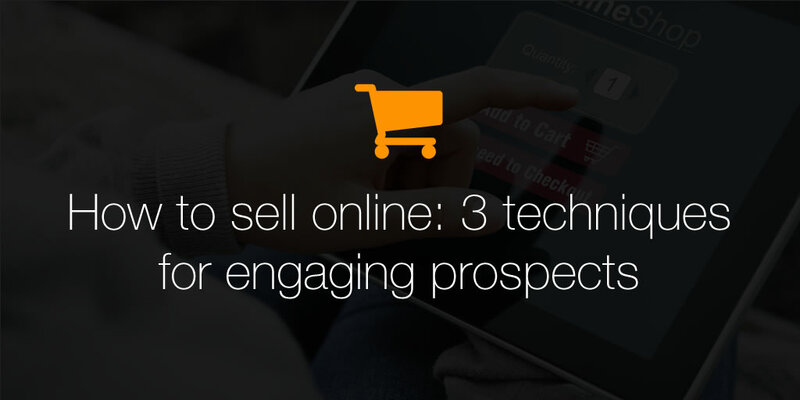 What are your favorite tools and tips for connecting with prospects online?